Thin, compassionate and painfully shy, Alex White may be the living embodiment of don't judge a book by its cover. "I'm the type of person that doesn't like seeing people get hurt," White said. Those aren't typical words from one of the state's best amateur mixed martial artists. As he readies himself to turn pro, White leaves behind an impeccable amateur mixed martial arts career. 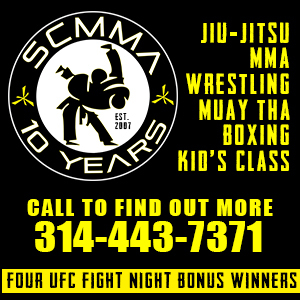 At 155-pounds, the Destruction MMA fighter racked up a 15-0 record and was considered the top amateur fighter in his division in both the state and, in some rankings, the Midwest. The 23-year-old dipped his toe into the sport just before turning 20. White ran cross country and track and high school before he first walked through Joe Worden's doors at Destruction MMA. "He came in as a raw athlete who had never boxed before," Worden said. "Everybody looks for that diamond in the rough and this kid's got it. I'd put him in with anybody." Worden believes that there is plenty that can be learned from a loss. Unfortunately, White never bought into that part of the plan. "I've tried to get him beat up," Worden said. "I've tried numerous times to get that kid beat." A devastating striker, White channels his aggression into all of his punches, kicks and elbows and then presses the ‘repeat' button. His devastating striking was on display over the weekend when he won the Ring Wars Winter Muay Thai National Championship in the advanced, open weight division in Omaha. White was the only competitor to finish his opponent in the tournament. Having his arm raised in victory, it seems, has been there from the beginning. After being with Worden for six months, White won the Ringside World Championships and from there he entered the cage. As the wins in the cage started to ratchet up, so did the confidence. "At first I was nervous because I didn't know how I would do against MMA fighters," White said. "But my record kept on getting up there. It comes down to mindset." That laser-beam focus and intestinal fortitude has been one of the key ingredients to his success. "I think it comes from the heart," White said. "If you're willing to do it, do it. Even though you're tired and it hurts, push." He also motivated to give back to what Destruction has given him. "They put so much faith in me and believed in me," White said. "That's helps me push myself. I don't want to let them down." With his pro debut set for April 7th in Branson at the Midwest Ultimate Cage Fights, the days of working a full-time job while fighting amateur are going to go away. White is betting that the financial sacrifice will be worth it in the long run. "Everybody has bills to pay," he said. "My wife is going to be helping along the way. For now, I'm going to train full-time and get my name out there." 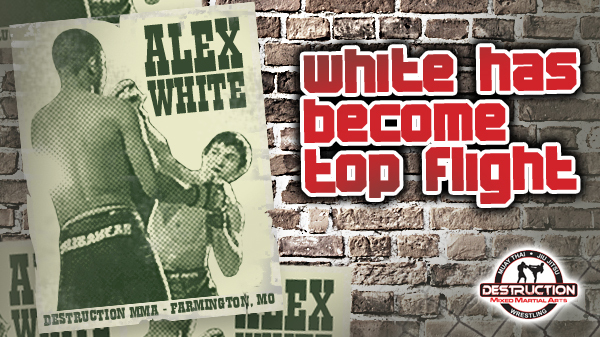 With superior striking to go along with his air-tight jiu-jitsu, White will now take his extra time to hone his wrestling skills. "I want to be a well-rounded fighter," he said. "I'm going to be ready."